ACDelco offers modules for electric fuel pumps and fuel pumps kits; both give you an optimal and efficient engine performance and ensure constant fuel flow. At the end of last year we launch the fuel pumps Value Line kits that will ensure maximum strength and durability with competitive prices. Quiet operation under all operating conditions. 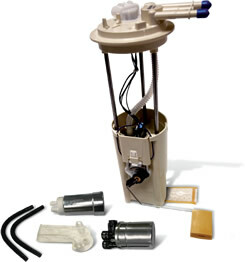 Includes all replacement components: filters or screens and accessories.